We live in an over-informed but under-transformed society. Books and seminars abound to help us find our way in this technology-laden world. We are oversaturated with information. But what our heart yearns for is not this, but the path of change deepens our heart and quickens our mind. Here, easy solutions rarely offer real help. One of the soul-guides from a distant age, Meister Eckhart (d. 1329), knew that the wellspring of happiness has to do with inner transformation. He described this often using a quite simple word: “Gelassenheit,” which we might render quite literally as letting-go-ness. Emptying our mind. Clearing the clutter. It is the power of releasing what binds us—to old habits that are not life-giving; to tired clichés about what we should have done; to ways of thinking that bind us and will not let us open ourselves to the deep source of life. Only when we empty ourselves of the demands that keep us off balance are we open enough to receive the source of light—which ever burns within us, whether we know it or not. The challenge is to let go, and find our way back to that still and vibrant center. can ever fully dim or finally smite. Yes, this light is always burning in our hearts. How do we find our way there? Not by doing, Eckhart reminds us, but by letting go of our need to organize, manage, direct. How do we do this? Ah, here’s the rub: by un-doing our compulsive need to be in control. Today, clear out a space and time in your life to begin this practice. Begin simply. Reduce your expectations, which, after all, are one of the hurdles we often never get beyond. That “ever shining light” is still there, under all the layers of darkness and worry, of anger and unhappiness. It keeps on shining, whether we know it or not. How do we find it? By emptying. Letting go of the clutter. Don’t try to “clean house.” Just sit where you are, and embrace the moment. Enjoy what it feels like to breathe deeply, and slowly—in, and out; in and out. Let your mind follow the movement of your chest as it expands and then contracts again. Try to breathe a bit more deeply than you normally do. Give yourself over to this rhythm. Enjoy the simple in-and-out of breath, the air replenishing your body moment by moment. Don’t try to do this in the “right” way. The way you are practicing, just now, is, for now, right. Read the words of this poem again, slowly. Yes, the world is in a messy state. And, yes, your own life is not what you might wish it to be. But it is what it is, and you are what you are—in this moment. The change comes, when it does, slowly. Incrementally. Like the sequence of your breath. Like the rhythm of day and night and day again. The lights shines, yes, deep within you. Change comes to us when we let go. When we allow our breath to be our guide to inner stillness. For it is here that the change begins. How do we do this? Eckhart would put it this way: by un-doing. By letting go. By practicing being empty, still, without expectation of what could or should happen in our lives. Strangely, this is the path that opens us to a freedom that waits within us, like that ever shining light in our hearts, until we turn from what binds us and open to what promises to lighten our burden—and our path. Practicing letting-go is one way we learn to find that inner stillness that is always there, deep within us. Change? Yes, this is what we desire. But we must relinquish our notions of what this looks like, and begin with the simple truth of the light that is always shining in our soul. Always. Even now. How much does this require of us? Not more information. And not greater demands. Rather, we must learn, day by day, moment by moment, to let go—more than we think we can. How much is enough? Eckhart reminds us that this path of inner change is not a project we can manage with goals, or hope to complete. It is a “wayless way,” as he liked to put it. An ongoing inner journey. One that frees us by degrees, as we seek to be the one being we were made to be: simple in our uncluttered soul. Radiant in our heart, despite the darkness that often hinders us. 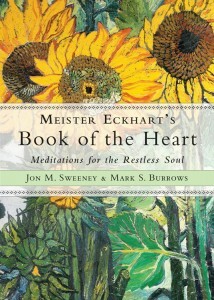 Mark S. Burrows is the author, with Jon Sweeney, of a newly released book, Meister Eckhart’s Book of the Heart: Meditations for the Restless Soul (Hampton Roads Publishing, 2017). A scholar of mysticism and a poet, he teaches theology and literature at the Protestant University of Applied Sciences in Bochum, Germany. Well known as a speaker and retreat leader, his work has recently appeared in Arts, Poetry, The Southern Quarterly, Reunion: The Dallas Review, 91st Meridian, Almost Island, and Presence.